A change in the weather is prime time for weather-related auto accidents. And even through Sacramento escapes the ravages of winter, the region still sees its share of accidents where weather is a factor. It may come as a surprise, but it’s not snow that causes the majority of traffic accidents. It’s rain. The National Highway Traffic Safety Administration says the majority of weather-related accidents (about 75 percent) are a result of wet pavement and rain. Sacramento auto accidents due to poor weather may not be as common as regions with more rain and snow, but that doesn’t make the cases less complicated. Auto accidents, by their very nature, are complicated. Throw weather into the mix and you may need the advice of a competent personal injury attorney. In reality, the key issue in determining liability in a car accident is negligence. Weather is important, but only in determining if the other person was using reasonable care in operating his or her vehicle based on the conditions. If not, they can be found negligent and held liable for the accident. For example, if rain makes the roadway slick, a reasonable person would reduce their speed below the posted speed limit to ensure they maintain control of their car and can bring the vehicle to a stop if needed. To do otherwise, would be negligent. If the rain turned into a downpour, a reasonable person may be expected to pull to the side of the road and stop completely. 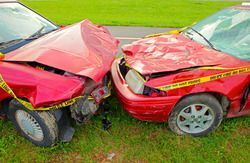 Traffic accidents are already complex, but you can readily see that weather conditions make the case even more complex as parties in the case argue what actions “a reasonable person” should take. This is the point at which victims in a weather-related auto accident realize the value of hiring a competent and experienced auto accident attorney. If you were injured in a car accident, you may be entitled to compensation for wrongful death of a loved one, medical expenses, vehicle repairs, and lost wages. Depending on the extent of the damages, the stakes can be high. At the same time, the legal system is complex and there are deadlines that must be met if you seek compensation. It’s understandable that an average citizen would find the court system confusing. Even if an insurance company offers to pay outright, you may still need representation. Insurance companies are in the business to make money and one of the ways they make a profit is by offering low-ball settlements. How does the average person know if a settlement offer is fair? It’s not something the typical person deals with regularly. That’s when an experienced attorney can help. Skilled auto accident attorneys handle these types of cases on a regular basis and can recognize when clients are not being fairly compensated. And if a court case is unavoidable, an experienced attorney understands the legal system and how to develop the proof you need to fight for just compensation. The Law Offices of Larry S. Buckley handle a variety of personal injury cases, including auto and truck accidents. We offer free legal consultations if you would like the merits of your claim reviewed. If we take your case, you pay nothing up front and will not be charged attorney fees unless a recovery is obtained on your behalf. Please contact us to schedule a free, no-obligation consultation.